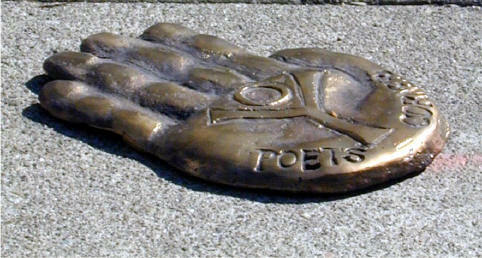 Read on September 22 at the dedication of the Poets Corner at the corner of Grant and Filbert. "Strike me with lightning! I'm here to be filled!" They wish only to sleep. No one loves them. No one listens! They're crushed by clockwork grooves. They seek diamonds to hone. Still, they'll recite for wine or pretty ones. Still, they wind up passed-out on somebody's couch. Alert and sensitive as rutting deer, tender as a pig's ear. Their art is neurotic. Their art is salvation. They may not be useful. They may be most vital. They keep shrines to gentle prophets. They arch their throats at the Tower. They dance and sit zam-zun by a cast-iron Ben Franklin. Their music is dangerous when they reach so hign. Their wounds and gifts that try to reach Joe, Joan and gods. 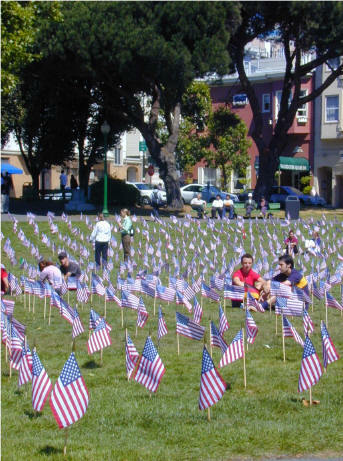 Washington Square Park on "'9/11'"
Will tell us again this day and night.